Old games and new versions of windows not alwasy go well together, but sometimes there are games which stay with us for a very long time and require some fiddling in order to work. Most of the problems with old games can be solved by simply running them in compatibility mode or as administrator. Starcraft does not need it, and Diablo does. These two games have another problem. Although they run, their colors are messed up. Luckily, once you know the solution it is very simple. Close explorer.exe and viola! the colors are good again. Closing explorer.exe has a price though. 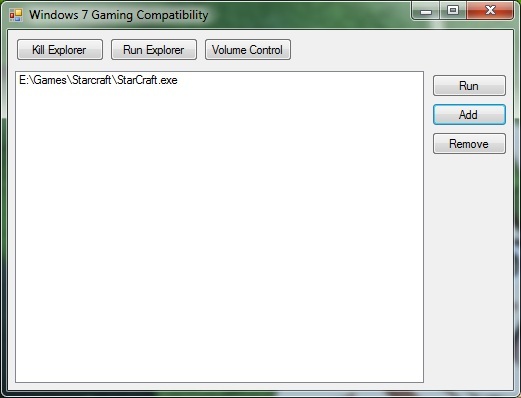 You can’t change volume, and it is harder to start up your games. In order to help with these two tasks, I wrote a little C# application which allows you to close explorer, run your games and open the sound mixer in order to control the sound. Extremely simple but useful. It can be downloaded from here: 32-bit, 64-bit, and the source code. Make sure to use the right architecture because manipulating explorer with the wrong version won’t work. Posted in C#, Games, Programming. Disk Usage Analyzer for Linux *command line* or Where has all my space gone?